Jenne and Michael had a gorgeous wedding in July of 2017. The weather was amazing. The ceremony was at St. Joseph University in Buffalo and the reception was at the Columns Banquets in Elma. For the idle, we went to Knox Farm State Park. This location is very rustic, with barns, wooden fences, and rolling hills. It is great place for wedding photos. We love it also for engagement, maternity, and family portrait sessions. When we arrive to a location, we always start with the bridal party for photos. We will take group pictures, then the groom with his groomsmen, and bride with her bridesmaids. We always try to get everyone involved and have fun. We know the wedding party does not really want to take photos, but this part of the day is important to the bride and groom. We keep everything moving as best we can, then send the party back to the limo and work with the bride and groom. In this image, we have Jenne and her bridesmaids. This is the second shooter perspective. We had all the ladies lean up against one of the fences. The back drop would be rolling hills. While I was taking that angle, Neal asked the bride to look toward him. He was standing off to the side. This was his angle and it looks great! Jenna has such a great smile. We always have two people photographing a wedding. Neal and Danielle Urban are a husband and wife team. 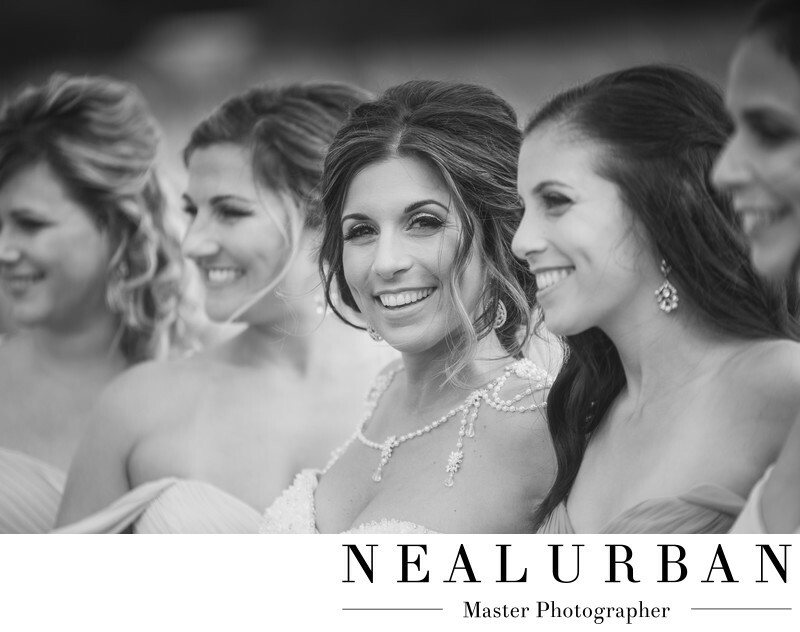 Clients will receive two different styles of images representing both Neal and Danielle. Having two photographers allows us to capture different angles and emotions, just like you see here.